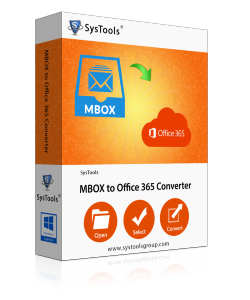 MBOX to Office 365 Migrator Software has been designed to move MBOX files to MS Office 365 in an easy manner. It majorly focuses on safe and secure conversion of the entire data. Users just need to launch the tool in the machine. Then they can choose the required MBOX data that needs to be migrated into Office 365 account. The MBOX File to Office 365 Migrator Tool also supports “shortcut keys” for migrating multiple MBOX to Office 365. This means if users wish to shift various MBOX data files then they choose them using CTRL. There is no need pick one file after the other. It can be achieved at once very easily with such a designing of the software. 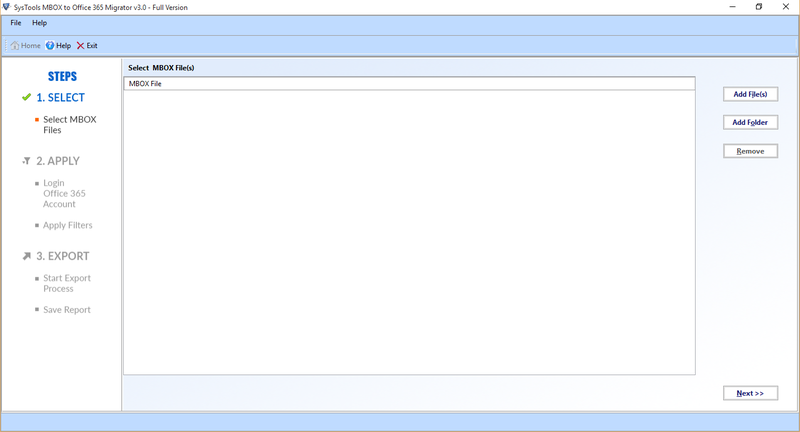 Many users wish to export deleted emails from MBOX files to Office 365, which becomes possible with this utility. Users can easily move the deleted emails from MBOX files via the simplified tool. The software even has the ability to convert deleted MBOX data files with no difficulty. Users can migrate these folders with deleted emails such as Inbox.mbox, trash.mbox, sent items.mbox , etc into Office 365. MBOX to Microsoft Office 365 Exporter introduced one more interesting, unique, and important feature. According to with impersonation, users need to provide the Office 365 Admin User ID along with password to import mbox file to office 365. On the other hand, in without impersonation, they need to put the password of each mailbox. SBD is a file that is created individually for each folder. Now, by using this tool the user can even move SBD to MS Office 365 very straightforwardly. The MBOX to Office 365 Migrator software is capable enough that it can migrate bulk .mbox file to Office 365 at once. In addition, this feature makes the migration process fast and accurate. There is an option to migrate only the selective categories. This means, in case users wish to move a selective emails then can go for date filter option. With this, only the selective email will be converted. On the other hand, they can move the all the emails at once if needed with this highly technical application. Preserving the hierarchy of the folder makes it easy for users to access the data once the conversion of MBOX files has been done. With this utility, users receive the same structure of the folders as it was before the conversion. Moreover, it keeps the entire data files safe i.e. without any data loss. Apart from all the features, Date Filter option is one of the helpful features for users. This option allows them to carry out selective conversion of MBOX files. For this, they need to provide the date in the column “From” and “To.” Once it is done, all the MBOX files falling under that range will be displayed and the users can easily import mbox file to office 365 . 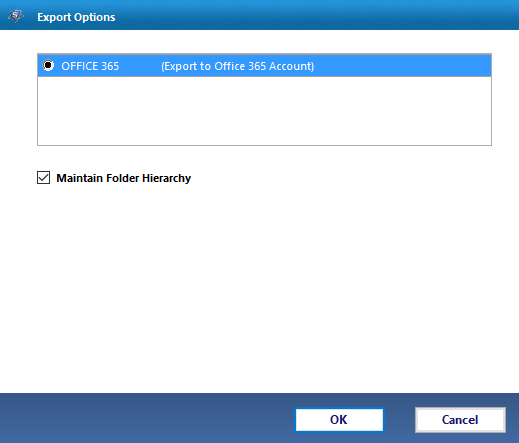 As soon as users hit on Export option, it begins the process to import MBOX file to Office 365. While moving the data, it displayed the progress report as well. Moreover, as soon as the process has finished, it generates a final report i.e. a completion report. Users can save this report for future purposes in any CSV file format. The MBOX to Office 365 Migrator utility is a Windows based application. Therefore, it can be accessed in any of the version of Windows Operating System. These editions include Windows 7, Windows 8, Windows 8.1, Windows 10, Windows Vista, and Windows XP. Users can run the utility in any of these versions and perform the migration. Does the MBOX to Office 365 Migrator tool permit for the conversion of selective folders? Yes, this software is capable to import MBOX file to Office 365 selectively using Date Filter Option provided within the Tool. Select Selective or Bulk MBOX File at Once. Provides In-built Date Filter for Migrating Multiple MBOX into Office 365 by date. What is the use of Impersonation option in the software? 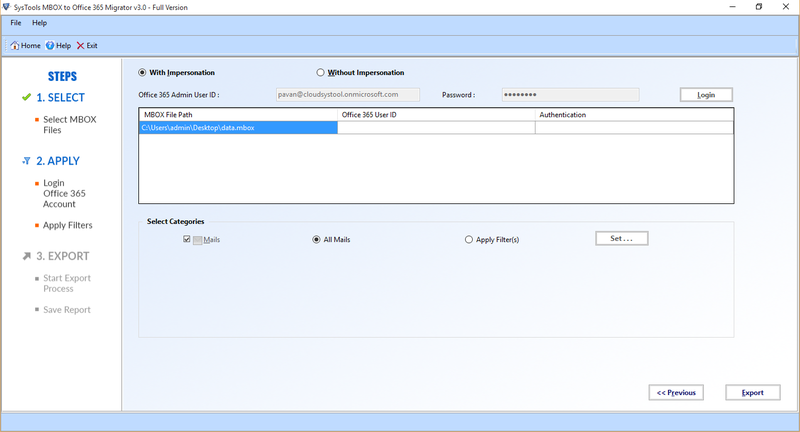 With Impersonation, it is possible to move various MBOX mailboxes at once by providing the ID and password of Admin. However, in without Impersonation users need to put ID and password for every mailbox. Can I run this MBOX to Office 365 Migrator utility in Mac operating system and execute the conversion? No, it is a Windows bases utility. Therefore, cannot be accessed in Mac OS X. Is it possible to migrate the MBOX files of specific date range? Yes, the software brings an option of Date Filter using this you can choose the emails falling under specific date range. Can I store the completion report of the process in any of the location? Yes,the software permits you to save the final report in any of the desired location. Is the conversion task of deleted MBOX files can be achievable with this? Yes, the tool has the potential to move all the deleted MBOX files to MS Office 365. 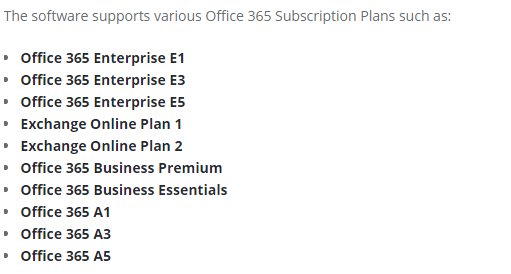 Which are the Exchange Online Subscription plans supported by MBOX to Office 365 Migrator? Impeccable Tool! Yes, really I have never used a software like MBOX to Office 365 Migrator. The task, which seems tough to me before now with the introduction of this utility has become the simplest one. Moreover, I have completed the entire process in few clicks only. I cannot choose one feature and say that it is my best feature from the tool. As every option it has in its panel is very useful and amazing. I found the interface very simple and the best thing about this is that it keeps the data safe during and after the conversion. How do I export MBOX emails to Office 365, was one of the challenging question in front me. 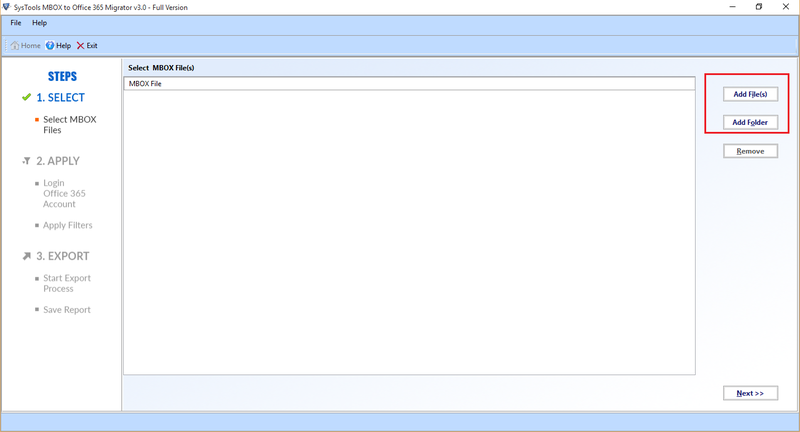 Then, with MBOX to Office 365 Migrator, I have accomplished this task very quickly. Really, I want to pay my regards to the whole teams for such an innovative thinking.